We continue our international journey in the world to find a biathlete everywhere; our next stop after Norway is again a big biathlon nation, Russia. And the biathlete who answers our questions is the always smiling Ekaterina Yurlova! Ekaterina, congratulations that you returned to the top 6 in two races again after two seasons (Östersund individual and Pokljuka mass start)! Are you satisfied with your performance in this winter? It is hard life to be a Russian biathlete – there are a lot of talented athletes and limited start places in the World Cups. How do you see your chances in the next season? 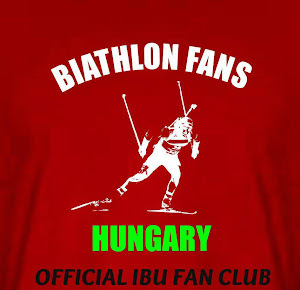 I think it is hard in others big countries too, where biathlon is a popular kind of sports, like Germany or Norway. Sure, our country have a lot of talented people. And sometimes it is hard to make all qualifications. My chances on the next season is the first to be healthy and improve my shooting and ski technic. And I think I'll be able to go back on the top level. Agree with you that OG is a main goal of each athletes, and me too. I'm glad that OG will be in Russia, and it's important in double for me. I hope that our resultats will be better, because Russians girls are stronger! out the preparation for the next season? I had a good rest and begin to training for next season. Do you have good memories of the Hungarian fans in Nove Mesto? I want to wish your fan group a lot good luck and to tell that you were the best in NMNM in your red t-shirts;) Thanks. Regards, Ekaterina! Thank you for your answers and thank you for the photo during a training in the World Championship! We wish you good work for the summer trainings and hope to meet you again!